Wow, time does whizz by. Sorry for not posting in April, the weather was too nice here to stay indoors! – T.H. We’re happy to announce that Hurly Burly will be joined by Hazina Bellydance for both our Sat. May 18 concert in Oshawa, ON, and our Sun. May 26 concert in Peterborough, ON. Exhibit tables of harp accessories will be in place. This concert will formally kick off the Northern Lights Harp Fest scheduled for October 2013. Registration will begin soon with a Christmas special in December. The line-up of presenters for the fest will be announced at intermission. Info courtesy of Joanne Griffin. The regular Ottawa harp circle is back! Schedule & info below, courtesy of Joanne Griffin. BRING: harp, music stand, tuners and tuning keys, music: Finale, Northern Lights International Collection. Books will be available for sale at each circle. All ages and ability levels are welcome. Island Mountain Arts is located in Wells, BC. The harp classes will be taking place in August of 2012. 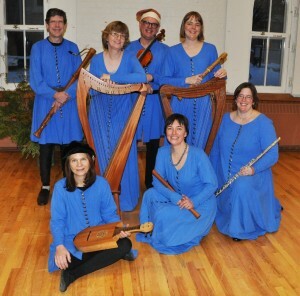 The Harp Gathering will take place from May 18-20, 2012 in Archbold, Ohio. The 2012 Dates and Info for the Goderich Celtic College & Celtic Roots Festival are up early this year! Both Kim Robertson and Sharlene Wallace will be there, along with a ton of other amazing Celtic and folk musicians. If you’re on Facebook, you can visit the Celtic Roots Festival Facebook page here. Goderich was hard hit by a tornado in 2011, and is still rebuilding, so they can use all the help you can give. Information on donations and volunteer efforts can be found here.